Let’s start at the beginning. The keyshair is a tiny Bluetooth device by which you can share your PC or Mac keyboard and, theoretically, mouse. 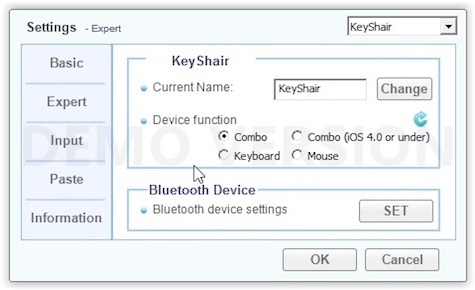 The software to activate and run the KeyShair is included on built in flash memory. The IOGEAR KeyShair is tiny, about the size of a small thumb drive. It could have been packed in a plastic blister to save on packaging. The physical product seems fragile and the contacts on the USB connector are exposed with no way to protect them once the stick is removed from the computer. The physical unit aside, the software that runs the device seems robust, if not immediately intuitive. With 4MB of storage on the KeyShair there is room for both a Windows and Mac version of the software. I am typing this on a Microsoft Natural Keyboard attached to my wife’s HP PC. The device is supposed to share the mouse as well but I have not been able to connect the mouse to my iPhone. 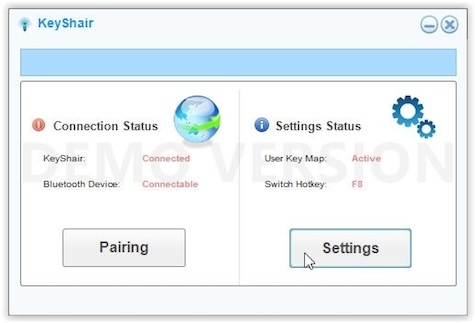 Though the instructions say that the mouse feature may not be available on all devices, the software clearly implies its use by offering a pre-iOS 4 option. There are four options for device type: combo, combo (iOS 4.0 and earlier), keyboard, and mouse. I am not sure if it is an issue with Windows 8.1 or the KeyShair software but when I tried to change this setting it crashed the software and locked up the system until I removed the KeyShair. I really wanted to like the IOGEAR KeyShair. Being able to use a full-sized keyboard while typing on the iPhone is much easier than using the built in keyboard. The configuration issues and software instability, along with not being able to use the mouse, I find it hard to give this more than a 4 out of 10 MyMac Review Rating.